A dual purpose attachment for both clamp and pallet handling. Useful in shipping, receiving and order picking operations requiring both palletless handling of boxes, crates and cartons, as well as palletized loads and scrap bales. I-beam arm bars have the strength of much bulkier square and round arm bars without the weight. The aluminum channels are bolted to two steel plates, forming a strong, rigid frame that resists flexing. The nylon arm bearings are locked inside the aluminum channels to protect them from damage. Modular, bolt-together construction makes parts replacement fast and economical. Heavy duty rotator with 360° of continuous rotation. Side stabilizer for inverting loads that are not bound together. 180° rotation stop group used when the load is repeatedly rotated in the same 180° cycle and a permanent rotation stop point is desired. 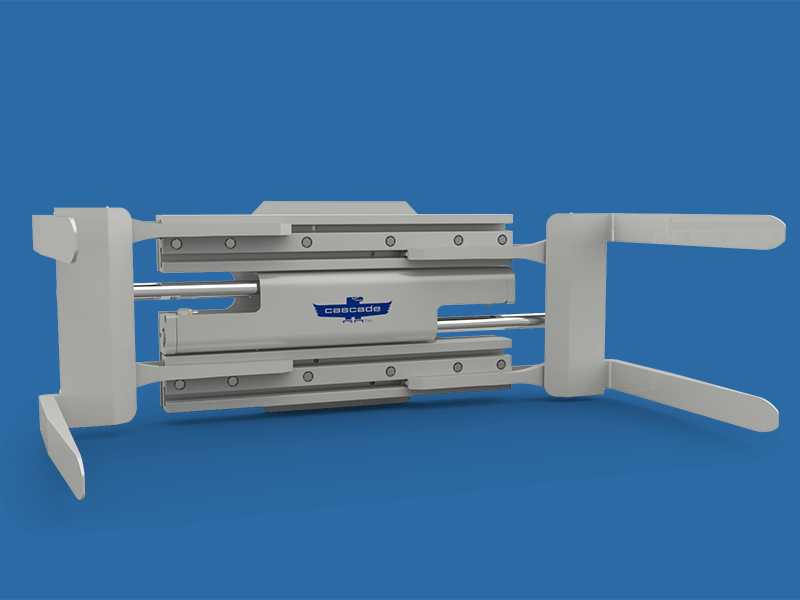 Flow dividers continually adjust hydraulic flow to equalize arm speed. Special extended opening and narrow closing ranges.